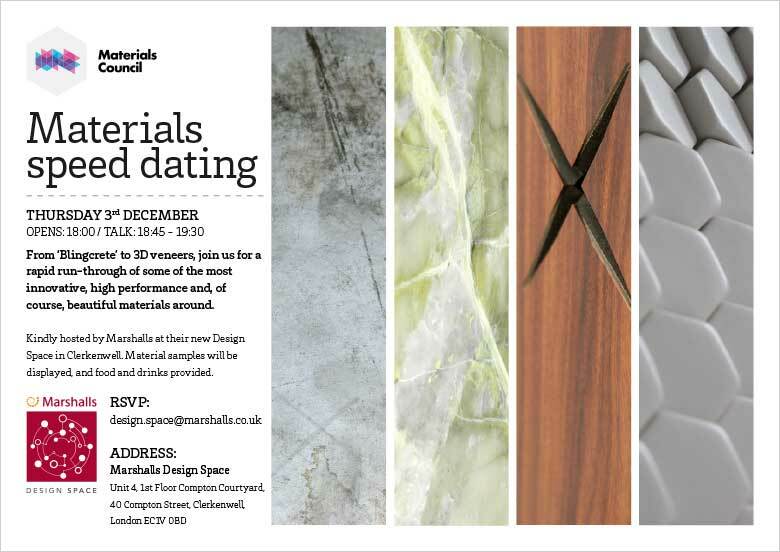 We’ve teamed up with stone and hardscaping behemoths Marshalls for a special Materials Speed Dating evening at their new showroom and workspace in Clerkenwell. Join us for drinks and nibbles from 18:00 on 3rd December as we present the most eligible single materials (dating starts 18:45). Marshall’s move into the interior stone sector over the last few years has been capped with the opening of their Design Space last month in Clerkenwell, allowing them to better connect with and serve the architecture and design communities. Read more about the space here. As part of their program of hosted CPDs and events, Materials Council will be presenting a specially tailored Materials Speed Dating event rapidly introducing a wide range of innovative and exciting materials, including fascinating natural stones such as Scoutmoor, the stone upon which Marshalls, and the streets of London, was built.